Plastic microbeads, often found in personal hygiene products, are getting rinsed down the drain and ending up in the Great Lakes and other waterways. To alert customers to these barely visible plastics, a new smartphone App lets consumers scan barcodes to see if a product contains the beads. The App was developed by the North Sea Foundation and the Plastic Soup Foundation, both based in the Netherlands. The beads are used in many common consumer goods as abrasives, said Sherri A. Mason, an associate professor of chemistry and the program coordinator of environmental sciences at State University of New York – Fredonia. “They’re also used in boat cleansers and other products as well,” said Mason. Manufacturers sometimes place the small beads in products to give consumers an exfoliating scrub. “In personal care products they act to gently scrub away dead skin in much the same way a sponge would,” as listed in Johnson and Johnson’s ingredient policy. The problem is that wastewater treatment plants are not equipped to filter or break the plastics down, according to Mason. Mason doesn’t worry that the tiny plastics are getting into drinking water. That water goes through fabric filtration systems before reaching taps. It is wastewater that concerns her. The plastics can be digested by aquatic life like plankton or zebra mussels and then passed along the food chain to human consumption, Mason said. The beads can pick up on other pollutants in the water and pass it along to humans, according to the 5 Gyres Institute. The 5 Gyres Institute, a non-profit organization that researches plastic pollution in the ocean, recently teamed up with Mason to study how much plastic is accumulating in the Great Lakes. Preliminary studies have found plastic particles in the guts of fish, according to Mason. The highest concentrations were found in 2012 in Lake Erie. Researchers found polyethylene and polypropylene that included traces of aluminum silicate and coal ash, often coming from coal power plants. Some of the samples had 450,000 particles of plastic per square kilometer. With lakes so vast — they are 20 percent of the world’s fresh surface water – it is hard to determine just how much plastic is going into them, Mason said. The free App has three alert settings to tell you if a product contains harmful plastic. 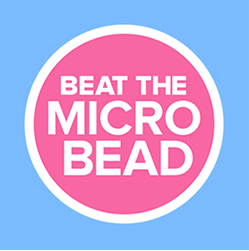 The red alert means that it has microbeads. Orange means that it has them now, but the manufacturer has decided to begin phasing out the plastics, and future products will no longer contain the beads. Green means the product is microbead free. The App can be downloaded for Apple products at the Apple App Store and for Google products at the Google Play Store. It is also available on Windows Phone Store. Researchers began asking companies to phase out the use of the tiny plastics in 2011, according to 5 Gyres. Unilever and Johnson and Johnson promised to phase them out. “We have stopped developing new products containing plastic microbeads and we are currently conducting an environmental safety assessment of a promising alternative,” according to Johnson and Johnson’s ingredient policy.